Many powerful open source projects have Node.js as a dependency, so often times you’ll need to set it up on your web server. But what if you wanted to develop and test your Node-dependent projects in your Windows PC before putting it up on the server? A note on nomenclature: The official name of the project is Node.js or node.js, and many people refer to it simply as Node or node. Throughout the tutorial, these terms will be used interchangeably. 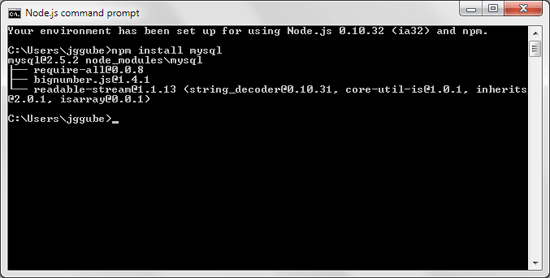 Node has a Windows and Mac installer, as well as binaries for Linux users. We’ll be going over how to install Node on Windows, but the general process is the same regardless of which operating system and OS version you’re using. 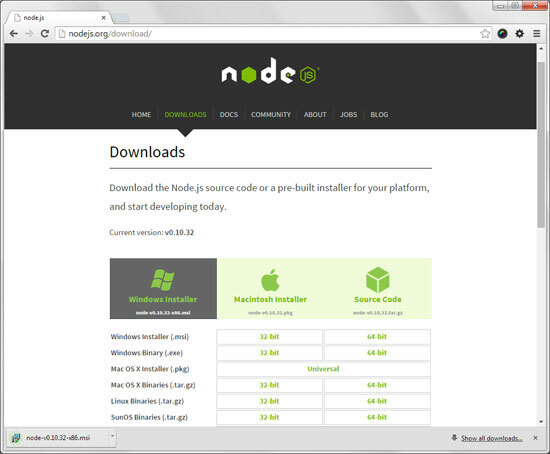 To start, head over to the Downloads page of Node.js. Click on the installer you would like to download and install. For this tutorial, we’re using the 64-bit Windows Installer, but you should use the most appropriate version for your set-up. 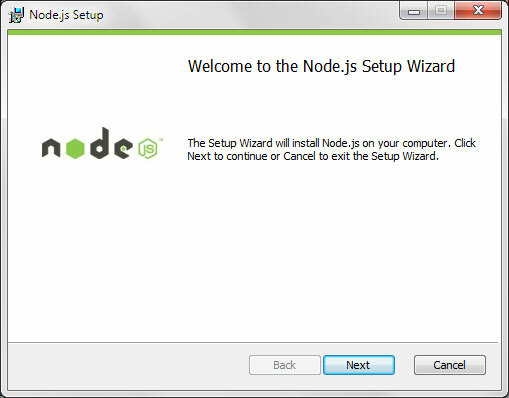 Click on the installer file from your computer to open up the Node.js Setup Wizard. 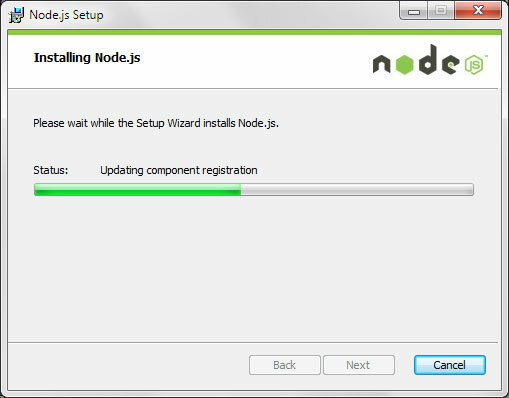 Just go through the Setup Wizard until Node has finished installing. After installing the Node.js platform, the next thing you will want to do is run a Node app from your computer. We’ll create a simple app for demonstration purposes. First, create a folder for your app. For my setup, I have a folder named projects in my Desktop folder. 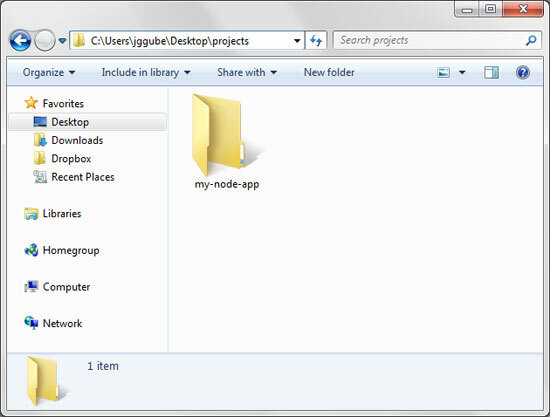 Inside the projects folder, I created a subfolder named my-node-app. The above code is a slightly modified version of Node’s web server example, which will create an HTTP web server in our computer. We’re now ready to run our first Node.js app. Open the Node.js command prompt, which you can do via the Windows Start menu. If you can’t find it pinned in your Start menu, just type “node.js” in the Search programs and files input field to find it. 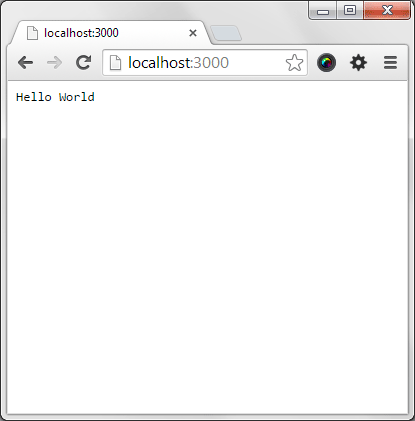 If all went well, we’ll see the text “Server running at http://localhost:3000/” in the command prompt. You should see the text “Hello World” in the browser window, indicating that everything’s good to go. Packaged modules make Node.js a much more powerful web app development platform. Think of Node packaged modules as being similar to plugins for jQuery and WordPress, or browser extensions for Chrome, or Gems for Rails; they extend your Node.js installation and/or provide pre-built functionality for your Node.js apps. npm is the default package manager of Node.js. It’s automatically installed along with Node.js by default. To find other node packaged modules you might want to install, head over to the npm website. The solution to the issue is to manually create the npm folder in the path that’s being displayed by the error message: Go to your AppData\Roaming folder and simply create a new folder called npm inside of it. Afterwards, issue the npm install command again to complete the installation. 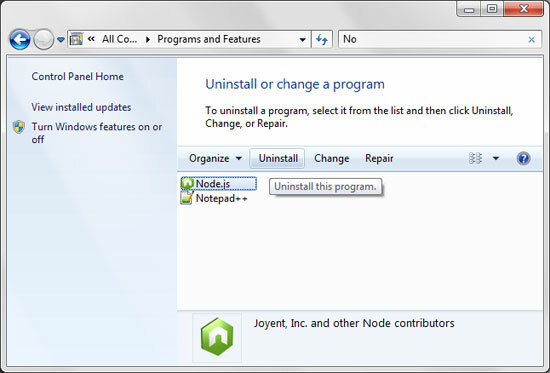 You can uninstall Node.js just like any other software in your computer. 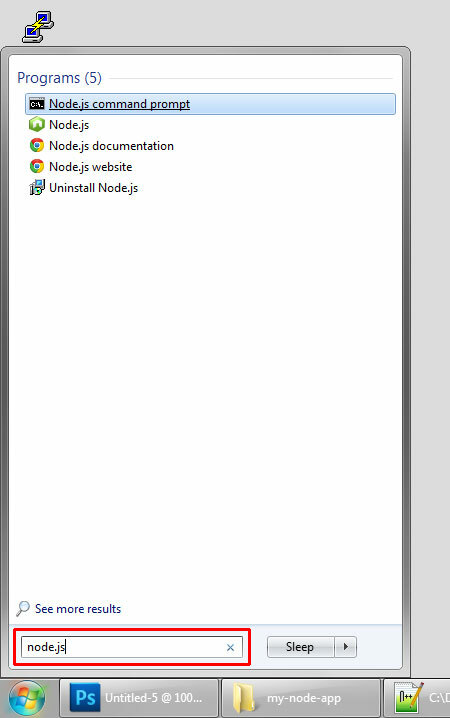 Go to Start > Control Panel > Programs and Features and then locate Node.js. 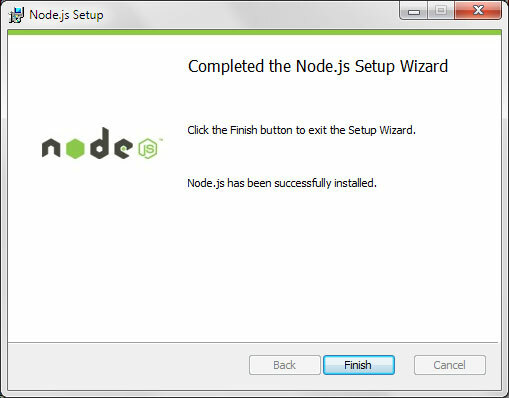 Click on Node.js, press the Uninstall button, and then just follow the prompts in the dialog window that appears.